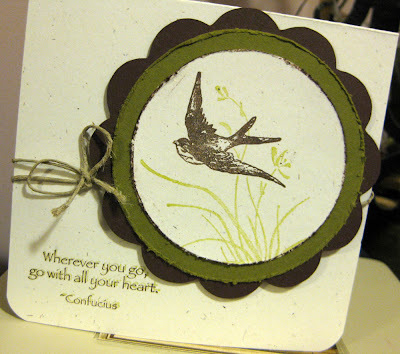 I have another card to share today that was inspired by a beautiful photograph that was posted on Melissa Phillips' blog LilyBean's Paperie. If you have never been, then you should immediately click over to check out Melissa's blog. She is truly an amazing artist and her creations have been a huge inspirational source for me ever since I started my own journey with this craft. Something about her style speaks to me on a very personal level--the layers, the textures--the chic, yet shabby elements--all work so well together to create little delicate morsels of eye candy! 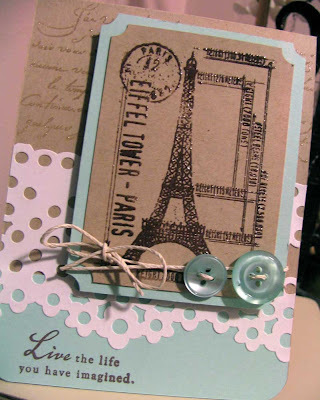 I love the soft and delicate colors depicted in the inspiration photo. I also loved the texture of the beaded buttons that are scattered throughout the picture. I started thinking of chunky glitter, a bit of embossing for texture,browns and lavenders with a touch of pink and possibly a sprinkling of copper pigment ink. As soon as I saw the embroidered slippers I knew that I had the perfect piece of patterned paper to use, from My Mind's Eye's Quite Smitten collection--an older collection, but relatively new to me. I also used patterned papers from Basic Grey's Bittersweet collection. 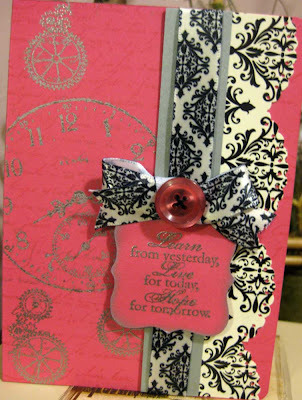 The card stock, stamps and ribbon are all from Papertrey Ink. I was also very much inspired by the vintage image I used for this card. I usually have a pile of just such images near my craft space and slowly work my way through them. This one was next and I just thought it would work so well with the rest of this card's concept. Also, as soon as I saw this image I knew I wanted to use it for a special card for the special guy in my life, my hubby. Now I'm nearly set for Valentine's day, just a quick stop for a few sweets and I'm all set for happy hearts day! 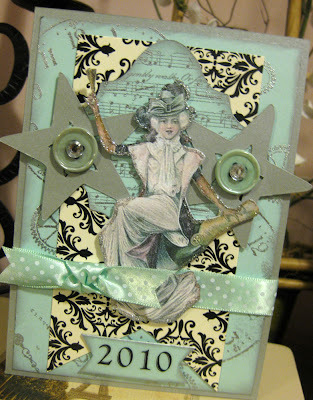 Another fabulous Tuesday Trigger over at the Moxie Fab World Blog, I just can't resist playing along. I have to say this color combo is just gorgeous! Turquoise is the new "it" color for 2010 so I'm sure we will be seeing more and more of it in designs, magazine layouts and hopefully in the paper crafting world. I also love participating in these challenges because it gives me a chance to stretch my creative muscles and step out of my comfort zone a bit. Although I'm happy with the way this card turned out, it is so different than my typical style. Thanks for the opportunity to think a bit more outside of the box Moxie Fab World! 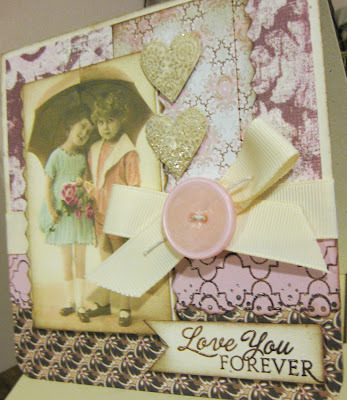 The glittery button used as an embellishment on this card is actually a rummage sale find I recently made. I love finding non-product type embellishments to use on my cards and rummage sales are always a treasure trove for just such trinkets. Another great source is Etsy. 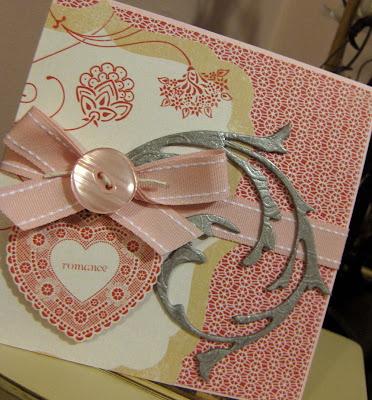 I'm planning on blogging about a few cards that I recently made using embellishments I purchased from Etsy and embellishments I made myself, so stay tuned for that soon. Here I go again with the pink and blue. This time the pink is Raspberry Fizz from Papertrey Ink, a striking hot pink shade. 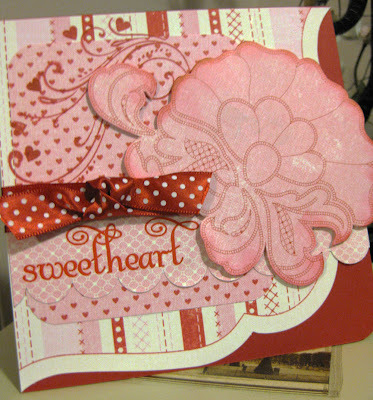 The patterned paper is from a collection from Stampin' Up. 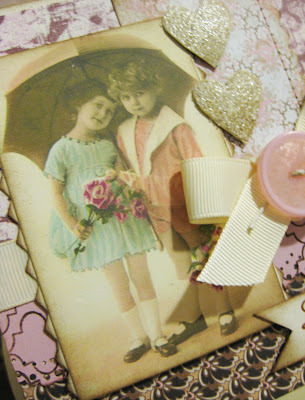 Since my vintage image takes up most of the front of this card and the patterns I chose are a bit busy, I felt I would be cluttering the design if I tried to squeeze in a sentiment. 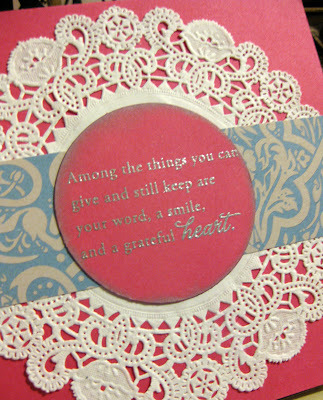 Normally, I always try to include a sentiment and leave the inside of the card blank. I mostly do this for my Etsy shop customers who prefer to personalize the cards with their own unique message. But this time I decided to switch things up a bit, since I couldn't fit the sentiment on the front, and include one on the inside. It also gave me a chance to use Papertrey Ink's set Heartfelt Sentiments, a set with some truly moving and inspiring sentiment stamps. 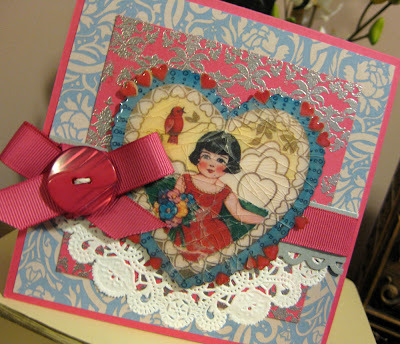 This is a color combo I just can't seem to get enough of this Valentine's season, blue and pink. These two cards featured today were actually made using aqua mist card stock from Papertrey Ink and various pale pink patterned papers. This particular shade of blue, Aqua Mist--is one of my all time favorite shades and I love using it! It works particularly well with vintage images as it just seems so retro and nostalgic. I love the months October through February because, although busy, the holiday's make everything so much fun. This year I managed to create a lot of holiday projects. I also feel that I really found my niche creatively as I was very inspired by the holidays and even sold a lot of my holiday creations in my Etsy shop. 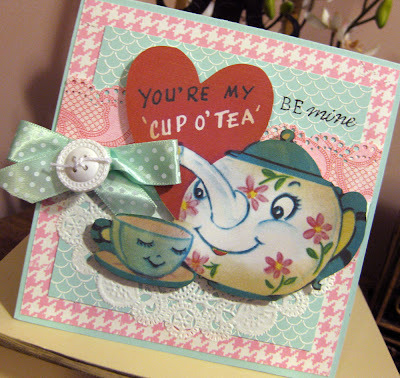 So I am happy to say that I have been busy putting together some really fun Valentine's day cards. It's perfect timing too, because as I finish up for Valentine's day and get ready for my new baby--I feel a real sense of satisfaction at having had the opportunity to accomplish what I have done creatively over the past year. Here's a quick and simple card I put together for this week's Moxie Fab World's Tuesday Trigger design challenge. I really have so much fun using the inspiration pictures supplied by this challenge to come up with my own creations, just can't seem to get enough. We woke up this morning to a white coating of snow, just the right amount to make everything look pretty without the hassle of having to pull out the snow shovels. In honor of this winter wonderland I thought I would share two cards appropriate for the weather. 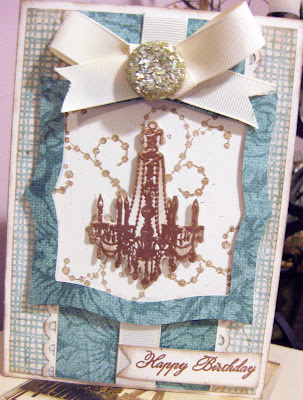 I couldn't resist playing along again with the design challenge over at the Moxie Fab World blog. I do really love the image of the room that was picked for this weeks trigger and also, the implication of warmer days to come and the easy living that it brings to mind. I think that the main thing that inspired me to jump into this one was that I would get to use my favorite Papertrey Ink card stock color, Aqua Mist. Luckily, I just had a few scraps left to finish off this card. I am expecting a new supply from Papertrey any day now, along with a bunch of other goodies. 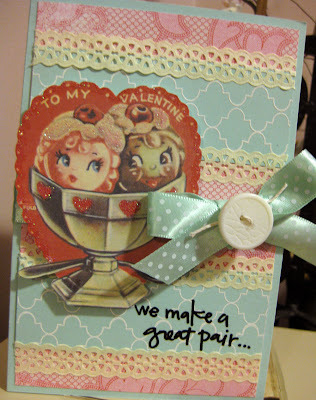 I plan on creating a partner for this card and will offer it as a set in my Etsy shop soon. Just a quick post today to share a few recent card creations. 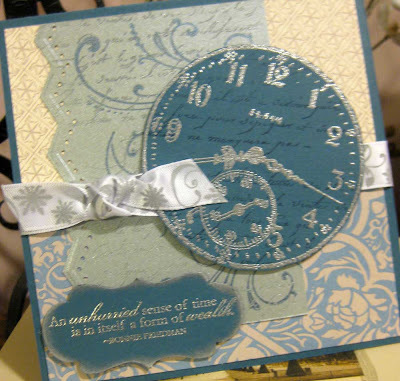 I believe I was inspired by the New Year to use this clock stamp image, but I think the sentiments are ones that I will use again and again, especially on the second card. That's a saying that will be great to meditate on when life seems to get overwhelming--I might have to tack that one to the fridge so I'll be reminded to do that everyday. I hope everyone is enjoying their New Year so far. It has been very cold here in central New Jersey and I have been feeling a bit under the weather. It's sad to say, but unfortunately true, I have yet to leave my house this year! Well, tomorrow my husband returns to work after a great two weeks off for the holidays and things will be going back to normal around here. He has been so helpful the entire time that he has been home, doing the food shopping and occupying our little guy so that I can rest, I do believe I've been spoiled! That's how my little guy responded this morning when I wished him a happy New Year. I thought it was very appropriate.